A big part of transforming and in general terms improving any forest, be it for economic, ecological or aesthetic values, is marking trees effectively for selective thinning. While some may object to trees being felled, not felling can often have greater detrimental effects to a forest overall. Un-thinnned plantations which may have been heavily stocked at the beginning to produce straight-stemmed trees may result in overcrowded situations where individual trees are stressed due to competition for nutrients (this was the case at Hollywood, so many trees were overcrowded that they stopped growing and resembled conifer ‘bonsais’). These trees would also give poorer timber returns and also be more at risk from disease. In aiming to transform a plantation to continuous cover one needs to selectively harvest poorer quality trees to create small ‘pockets’ in the forest canopy to allow regeneration of other species on the forest floor. Therefore any tree thinning is a skill and a balancing act to deliver a range of ecological, economic and amenity values. In my own case, and this is the first question any forester will ask a forest owner, I have to think of the long-term aims for the forest. The aims might include: are you managing the forest for its fuel, biodiversity, amenity, high value timbers, or a range of these objectives. A forester and attentive forest owners who are interested in managing forests for the long term (and which all forest management will be moving toward) will aim to make sure the forest ‘capital’ is ever increasing to offset the costs of forest management, this includes thinning costs. At Hollywood, we are looking for fuel for ourselves (as I write this one our neighbours is loading up his van with Hollywood firewood), and to improve the biodiversity and the quality of its soil, thereby improving the resilience of Hollywood for the long-term. Its important to remember too, if a forest is offering a lot of value, its future is more secure too). We also wish to improve the quality of our trees too, so that any felled in the future will receive the best market value. This means the upkeep of the forest is always at a minimum cost to the forest and ourselves. But there are intangible values too. As our forest diversifies, its aesthetic value has already improved and we have more varied flora and fauna. Unfortunately these values, along with carbon and soil improvement values, are still overshadowed in the forest sector by an emphasis on economic values. This is the case in Ireland at present, and it is understandable as we have only recently begun to establish a wood culture again in Ireland. However this is changing when people understand the wider values forests play for so many aspects of life and through such education days like this. In my own case, I have gained some limited knowledge of identifying good quality conifer trees from my own site when the LISS team came to assess my site and my forest activities in January (and from attending ProSilva days over recent years). However, its one thing looking at trees in a small site then being asked to mark trees in a large plantation! What I was pleased to find is this thinning training, organised by UCD PhD researcher Lucie Vítková for the LISS project, is that the results of the training will be analysed immediately for Irish journal publications in the coming months. This will mean that the value of this new forestry training will be quickly circulated to the Irish forest sector. 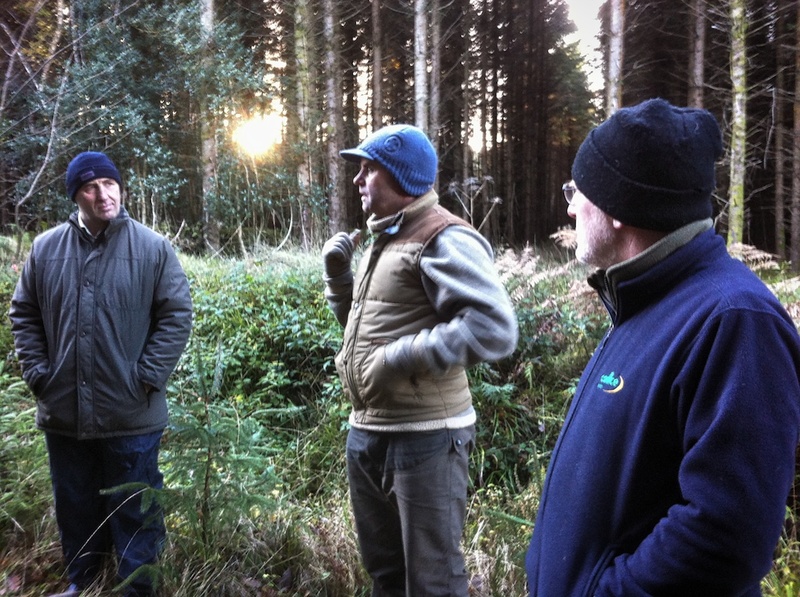 Over a couple of days, Lucie, Padriag, Paddy and the LISS/UCD team had organised people from across Ireland to come to ‘mark’ trees for forest thinning training at the Tikincor Marteloscope – a permanently set aside forest where the quality of each tree has been previously evaluated by a professional forester. And what’s really motivating (and fun) is each person’s improved tree marking skills can be evaluated instantly using new forestry management software. However, to tell the truth I was feeling a bit of pressure not being a forester, for this exercise. I was in was the ‘forest owners’ group; there were others groups of people in the forest sector who had good tree marking skills, another group were foresters who were not familiar with this type of thinning and another group were forest students. Nevertheless, my heart sank when I realised I knew one of the people in the my group, a retired forester who had managed the Duke of Devon’s forests in Lismore, Co. Waterford for many decades – oh no!! There was no way of getting out of it – I knew my results would be recorded and compared to a leading forester. However, apparently we were all in the same situation of not being familiar with this type of ‘crown thinning’ (there are several thinning regimes for forests). Its easier to explain the tree marking and what a martelscope site is through the slideshow below. But just to introduce the exercise: we were set out to ‘mark’ the forest initially to our best ability. We did this by logging the numbers on a clipboard of the trees we thought should be kept and those to be removed (each tree in a marteloscope site has a green number on it). Then Paddy and Padriag gave us crown thinning training and we returned to mark the same forest again with this new knowledge. While we were doing all of this, Lucie entered the numbers for each of our attempts and analysed the results using the forest thinning software (all from the back of the UCD van which is really a mobile office; it also had hot drinks and biscuits which were appreciated as it was a chilly 5oC that day). My first results, as I expected, were desperate. While I had recognised some of the better quality trees, I had taken out such a percentage of the forest that it would become unstable and my thinning would have led to wind-throw (trees falling over). Paddy remarked that the forest would have perhaps taken years to recover but assured me that training would help! My log sheet for the first thinning – we weren’t given any instruction other than mark for thinning the best we could. On our second round of marking we were given training and told to mark specifically for ‘good’ frame or future trees first and place their numbers in the right hand side. Identifying the ‘future trees, first made all the difference! This photos shows some poorer quality trees: in the foreground is a tree with forking, behind it to the left, is a tree with dripping white sap – indicating that it is possibly diseased. If appropriate to give space to any nearby ‘future trees’, these poorer quality trees would be ‘marked’ for removal. One of our group – it took us each about an hour to ‘mark’ the stand. There is a lot to think about as you move through the forest as you don’t physically mark any tree – so you have to remember all the trees in a certain area. Of course, was later told that Paddy would mark an area like this in ten minutes! Lucie making sure we had a hot drink between tree thinnings. Dogs are always keen to learn about forestry – note the Sitka spruce regenerating here. My results from my thinning after getting training. The software can calculate: the percentage wood removed in cu metres, the percentage of diffreernt wood grades removed (you do not want to harvest any of your best quality trees, or only a very low percentage), the amount of biodiversity (in this plot it was low but you can create a ‘halo’ around native species allowing them more light to regenerate). The software can also calculate instantly the value of your thinnings at todays market rates too. And I’m pleased to report, that my tree marking skills after training were dramatically improved -thanks be!! Still room for improvement of course but I took out close to an ideal percentage to be harvested that would not damage the overall stand stability, around 23%. I also learned not to take out any of the best quality trees too. However I didn’t really make the best judgement in grading and taking out the very low quality trees – the trees in this site were marked B quality (these were the ‘frame’ or ‘future trees’ that you want to keep in the forest to improve its value and resilience), C and D trees, in decreasing value – these trees may be too branchy or forked, crooked (even a slight bend in a trunk will affect its timber value), suffering from disease (perhaps caused by the tree being knocked or its roots damaged). So I’ve returned home to Hollywood with a new skill and a keen eye now on how to identify the strongest and most valuable trees in my stand. Perfect timing too as I have been meaning to high-prune the better quality trees in Hollywood. Now I have a lot more confidence to identify which are my future trees and how to best favour them. The only thing though is thinning can improve the rate of tree growth and we are already swamped with firewood!! But a good complaint, isn’t it? My thanks to Padriag, Paddy and Lucie for inviting me to this training day. Very enjoyable – when will the rest of us get to experience this training? And worrying that you could really destroy a wood if you are untrained…. I will ask the LISS team. I don’t think anyone would going into a large forest and try to thin without experience – you need to obtain a felling license in the first instance and for all that investment in growing you would hope people would be careful about their forest. Generally thinning would have to be done by a forest contractor – I think people are realising that a different skill set is needed for maintaining forests rather than clearfelling. I only had a understanding on it before now due to an in depth session with the leading lights of Pro Silva whilst we were in Greece!